On Wednesday, Kim and Kourtney stepped into the spotlight (OK, paparazzi camera flash) wearing coordinating black Versace gowns. The dresses seriously seemed like they were made to come as a set. While both showed ample cleavage (what’s new? 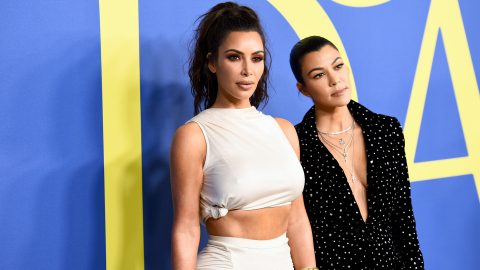 ), Kim and Kourtney’s dresses each showed different parts of the chest, making it look like fabric from one was used to make the other. It reminds me of when you cut a heart out of a piece of paper—you’re left with a heart-shaped item as well as a rectangle with the shape of a heart cut out. It’s a two-for-one, just like Kim and Kourt in Versace. The biggest difference between the sisters’ ensembles was their choice in shoes—Kim in clear heels and Kourtney in black, pointy-toed ones. Plus, Kim went for a mermaid hair look, while Kourtney chose a half-up hairdo. Other than that, though, they look like characters out of a dystopian novel I read in middle school—part of an army of perfectly coifed clones.